Are you guys ready for some amazingly easy meals this week? It is our first week back to school this coming week and I am all about quick and delicious meals. I love having a home cooked meal and being able to sit down at the dinner table and talk about our days and tell jokes. But I know that with the start of school with homework, sports, piano, etc. etc. it starts to consume our lives. So today I am bringing you an easy one pan meal that will blow your family away! Not only is it easy to make and throw everything in one pan, the flavor it OUT OF THIS WORLD. The chicken gets coated in an amazing parmesan garlic crumb coating. But the crispy coating doesn’t stop there. The fresh vegetables also get tossed in the same flavorful crumb mixture. You guys. My family could have this meal every week for the rest of our lives and we wouldn’t get tired of it! You will not regret putting this meal on the menu this week. In fact, I am begging you!! It couldn’t be easier and the flavor is outrageously good! It was loved by the entire family and is one of the best one pan meals that you will make! This is sure to be a huge hit at the dinner table! Preheat oven to 350 degrees and lightly spray cooking spray in a 9x13 inch pan. In a shallow dish melt butter. In another shallow dish add bread crumbs, parmesan cheese, and garlic powder. Salt and pepper the chicken. Dip into the butter and then coat in the parmesan garlic crumbs. Lay in 9x13 pan. 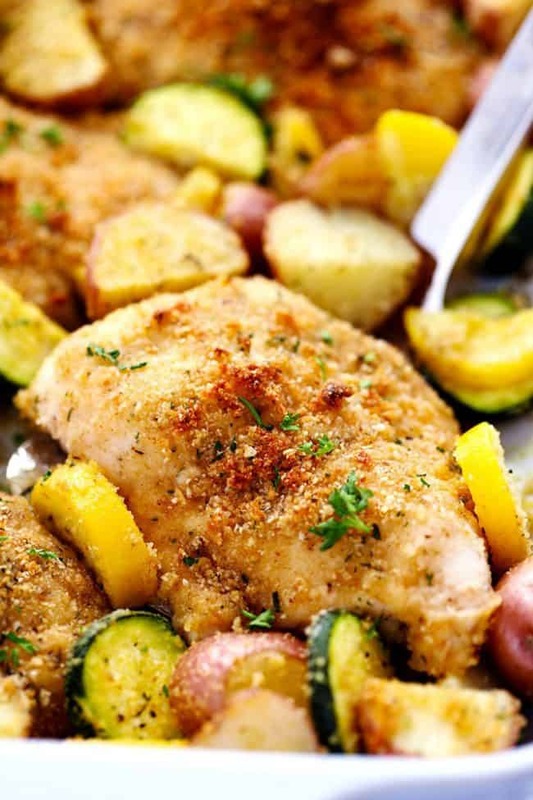 In a medium sized bowl add zucchini, yellow squash, and potatoes. Toss in the olive oil. Add some salt and pepper and remaining parmesan garlic bread coating. Lay on the sides of chicken in the pan. 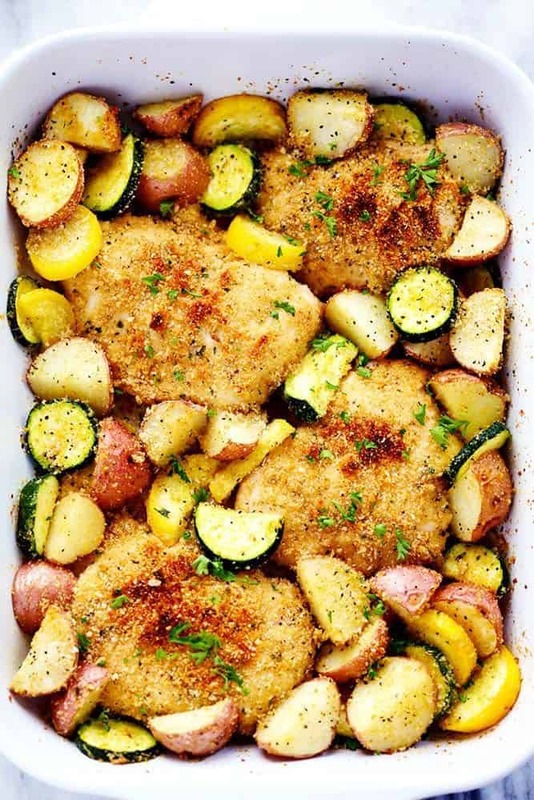 Bake for 30-40 minutes until chicken is cooked throughout and vegetables are tender. Hey girl I would love this one! Yummy! This recipe is amazing, but my family (other than myself) won’t even look at zucchini. Do you think I could substitute broccoli for the squash? You can definitely substitute for a veggie that your family likes! Kris either Broccoli or Cauliflower either one my family likes neither. But they didnt like zucchini either till i secretly started substituting it for cucumber and waited for a little while before I pointed out how much they liked it. Do you have the calorie,carb,fat,protein and fiber content? The best way to find out calories is by using my fitness pal. The chicken was very flavorful, but the vegetables were not done in the 30-40 minute cooking frame. Because I didn’t want the chicken to over cook I ended up finishing the vegetables in the microwave. Next time I will precook the vegetables and finish in the oven. Everyone enjoyed this dish. How long did you microwave them for? Im trying this right now. Looks delish. Question: do you flip the chicken so it gets crispy on both sides? Is there a lot of liquid in the dish from the veggies and chicken? Thanks in advance! There was a bit of liquid in the pan when I cooked it and it was not really crispy, but it was delicious anyway–kind of like a gravy. This is super easy which I adore , but the 40 minutes wasn’t nearly enough time for the veggies. In particular the potatoes are still hard as a rock after 35 minutes. I always recommend tenting the pan with foil to help the potatoes to cook faster. 30-40 minutes isn’t nearly enough time for the veggies , in particular the potatoes , to be done. After 35 minutes the potatoes are still hard as a rock. I always recommend tenting with foil if the potatoes aren’t cooking very fast. i bumped my oven up to 375. worked out well. This is delish…will definitely be making this again. I put veges in a separate cooking plate and it worked out well. I followed this recipe step by step and did not find it to have much flavor at all. I think adding either a ranch or italian dressing packet and maybe minced garlic instead if powder would kick it up a bit, but it definitely needs more seasoning! I would also boil the potatoes for a bit prior to adding them to the pan. Some were still hard after 40+ minutes. What kind of pan do you recommend? I made it and it wasn’t very crispy, it looks from the pic like it should be crispy. Thank you! The flavor was great! I used a 9×13 inch pan. The chicken should stay crispy with the coating as it bakes. Can I use a non stick pan for this in our oven? If so, how hot should It be to be crispy too? Tried this recipe twice, good flavor but very soggy. Second time spread out on cookie sheet under high broiler! A little better. Mine didnt turn out crispy. I followed the directions perfectly.. I covered it with tinfoil like you said also. 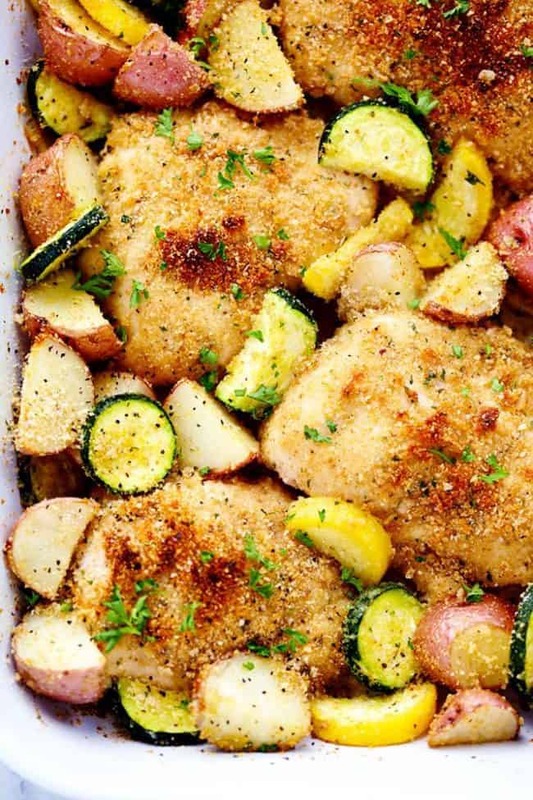 I baked the potatoes for about 25 minutes and then added the chicken and other veggies on a separate pan and cooked everything 30 more minutes – it all came out perfect. It looks awesome, but unfortunately i’ve been baking it for 45 minutes now and the chicken is still not cooked thru – after seeing the comments, i didn’t even think to check the potatoes. i just added another 10 mins and upped my oven to 375 degrees.. hope this allows the chicken to cook thru. takes longer. I like to preheat at 400 and turn down to 375. I made this and it was so delicious! I used Panko instead of bread crumbs and it was perfectly crispy! I also added some broccoli florets with the veggies! Only problem was I had too big of chicken breasts and too many veggies for 1 pan, so I used an 8×8 pan for the veggies that didn’t fit. Making it again tonight! Oh no! Im sorry that it didn’t turn out for you. It should have cooked the chicken just fine? Maybe you used really thick chicken breasts? I used just regular ones and it turned out great. Great chicken, but definitely start the potatoes about half hour before. Chicken took 40 minutes at 350. I’ll make it again though, so thank you! I made this tonight. It was delicious! I cut the chicken into pieces and the potatoes in cubes. I mixed some Cajun seasoning in the breading. Everything was cooked in 30 minutes. I don’t think you did anything wrong,,, it needs to cook longer,, uncovered will help it get crispy.. I loved the flavor as well as my daughter and boyfriend loved it.. had to cook it almost an hour to crisp up vegetables and cook potatoes.. some potatoes were slightly hard.. I am not doing potatoes this time.. I sliced a whole sweet onion.. added that and omitted potatoes.. I think potatoes would have to be par cooked first in microwave to cook up with the squash.. I did cute and cube my potatoes small.. but they weren’t fully cooked.. I have faith that the onions sliced like an onion ring will come out awesome.. and I love the ease of a one bake dish!!! Super yummy! Same thing happened with veg. So I par cook them and then throw in oven. It’s getting hot, I don’t want to use my oven. Any suggestion on grilling this meal? Delicious! For those who can’t get the veggies to cook through: cut the potatoes smaller, tent with tin foil, turn the oven on 360 convection bake, cook for 45 minutes. A flavorful addition: the juice of two lemons drizzled all over it before you pop it in the oven. Made a big difference, and really brightened up the flavors. Of course this added to the liquid in the pan, but we ended up really loving the crispy top of the chicken, with the juicy lemon-y veg below. Thank you! Great meal I will definitely make it again! Mom I think you’d like this recipe. I’d cut the potatoes pretty small though because they didn’t cook all the way in 40 mins baking time. Very tasty but it definitely takes longer than 30-40 minutes for the potatoes. I ended up pulling the veggies out of the oven and microwaving till the potatoes were cooked through (6 minutes on high after baking for 40 minutes) and then added them back to the pan. I sprinkled them with more of the cheese/breadcrumb topping and broiled on high till the chicken crisped up on top. I cooked at 375 for 30 minutes and when that clearly wasn’t working, I increased heat to 400 for another 15 minutes before doing the broil. Overall, it was a hit but do yourself a favor and get the potatoes mostly cooked before you put anything in the oven. Very delicious and so easy to fix. Hello, I have a question about this recipe. Is it possible to substitute the Garlic Powder for normal Minced Garlic? Be making this one many times in the future. Thank you for sharing! It tasted wonderful but I came across the same issues as pp. my veggies were not done in that amount of time. I had some veggies that didn’t fit in the pan and I wrapped wrapped in foil and steamed them- those were great. Next time I’ll steam all the veggies together & bake the chicken as directed. The flavor was great! Alyssa, I’d encourage you to edit this recipe because the red potatoes simply don’t get done at 350° in 40 minutes. I made this without thinking to read the comments first and found out the hard way. Enough people have commented about this that it would be helpful if you just change the instructions. 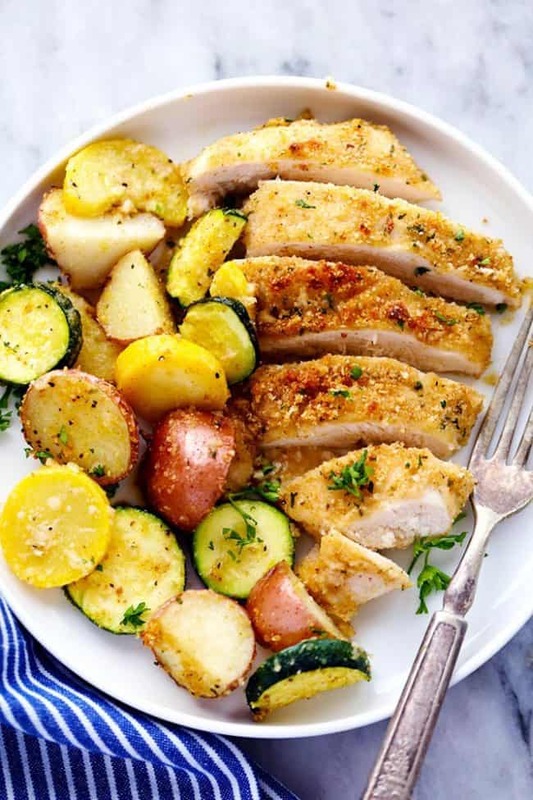 Like maybe cooking the red potatoes first at 400° (or even 425°) for 30 minutes then adding the rest of the veggies and chicken and turning the oven down to 350° and cooking everything an additional 20 minutes or so? The chicken should have no problem cooking at that temperature if they are cut in half lengthwise. One additional comment… I turned down my oven to 350° after cooking the potatoes for 30 minutes at 400° and that was a mistake as my chicken was not cooked through. I even had my chicken sliced long ways to cut the cooking time down but it didn’t help. Nope, next time this is getting cooked at 400° the entire time. can I just use potatoes no veggies?